1) Once you have ensure that the item(s) inside the shopping cart is correct, select and confirm your delivery address under Section 1 of the checkout page (Figure 1). 2) In Section 2 of the checkout page, select and confirm your preferred delivery method (Figure 1). 3) Beneath the delivery method selection box is a link to the Terms of Service page. Please click on this link and read the Terms of Service carefully. Once you have read our Terms of Service and agrees to its contents, please tick the box " I agree to the Terms of Service and will adhere to them unconditionally. " The payment methods under Section 3 will now be displayed (Figure 1). 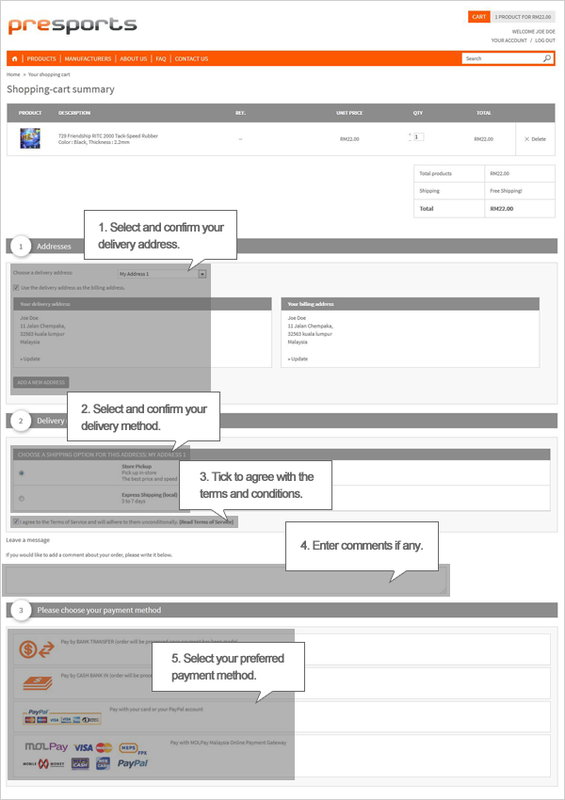 4) If you have any comments or instructions regarding your order, you can add them into the comments section (Figure 1). 5) Select your preferred payment method under Section 3 and proceed to make your payment (Figure 1). 6) After selecting the payment method, you will be taken to the respective payment websites to make your payment. The instructions for making the payment will be provided by the payment processors. After the payment has been made, you will be redirected back to our website. It is very important that you confirm your order after being redirected by clicking the "Place My Order" or "Confirm My Order" button so that your order is recorded on our website.